While K and I had enjoyed a low-key Chinese New Year celebratory lunch in Zagreb at Asia T House, there was one key element missing – authenticity. The food was cooked well but when all the other diners in the restaurant are Croatian, you end up missing the most endearing part of a great authentic Chinese restaurant – all the tables talking over each other in loud Cantonese or Mandarin, a constant chatter that’s particularly soothing to my ears. On our first quick stop in London (20 hours between Zagreb and Dublin! ), we had just enough time to do a quick tour of Hyde Park, Buckingham Palace and Kensington Palace before heading back to our hotel for some shut-eye. On our way back, we stumbled across New Fortune Cookie in Queensway, a street hosting more than a handful of Chinese restaurants. It only took one glance to see that New Fortune Cookie was the most authentic of them all though, with tables filled with local Cantonese people all talking over each other, the noise of the restaurant hitting the street every time the door opened. 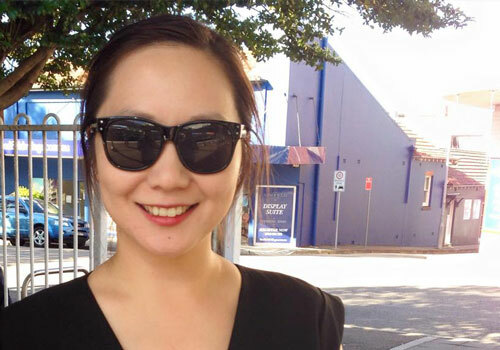 Once we heard that noise, there was no question of where we were going to go for dinner – New Fortune Cookie was going to give us the noisy Chinese New Years meal that we’re accustomed to in Australia with our families! We knew we chose the right place as I heard the head waiter greeting a few families by name and wishing them a Happy New Year – regular business from local Cantonese families is definitely the sign of a good Cantonese restaurant! K was very impressed with me as I asked for a table, ordered tea, and ordered our meal all in Cantonese. To be honest, I was a bit impressed with myself as well – I know my recognition of Chinese characters is still very rusty, so knowing that I can still decipher menu items (clearly the most important use of the language) is a relief! 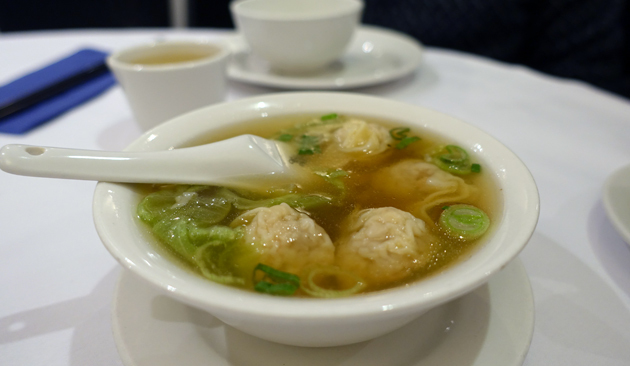 I started us off with a Wonton Soup, four plump pork and prawn wontons in a soup with a surprisingly depth of flavour – this wasn’t a simple MSG soup, this was a genuine soup from home-made stock. A nice and simple soup using quality ingredients to really help you build up an appetite. Our appetiser was the Sesame Prawn Toast – a nostalgic treat for both K and I that we had just been reminiscing about a few days before. 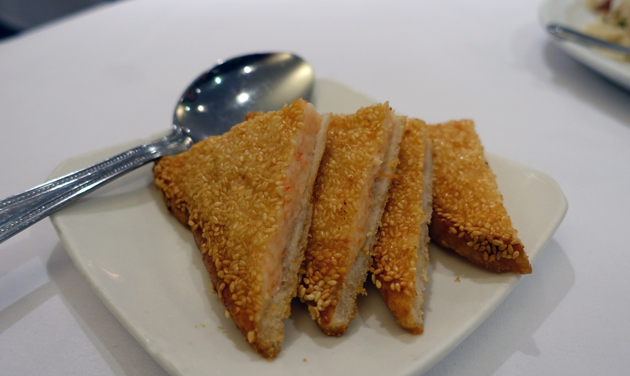 I remember my parents making prawn toast when I was a child – they owned a takeaway shop, and it was definite a favourite of many of our regular customers! It’s a dish that I’ll have to try to make when I get home – and I’ll definitely use an extremely thick layer of prawn paste like these ones from New Fortune Cookie which were very generous! 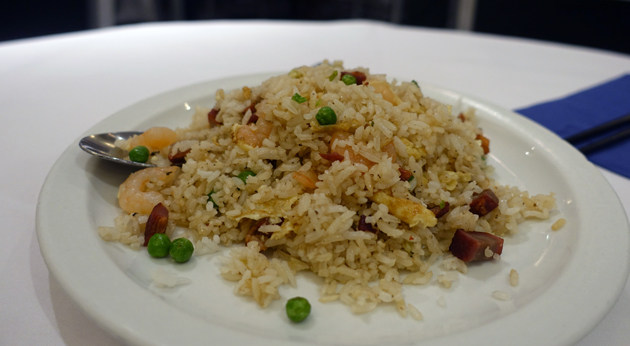 You can’t have a Chinese meal without rice in some form – so I ordered the Yang Zhou Fried Rice with prawn and BBQ pork. In hindsight I really should have ordered the chicken and saltfish fried rice, as this yang zhou fried rice lacked oomph. There was hardly any flavour to it, and it tasted as plain as steamed rice. A pity, as it could have been a great dish if they’d added enough flavouring to the mix. The Half Roast Duck was an absolute delight though. 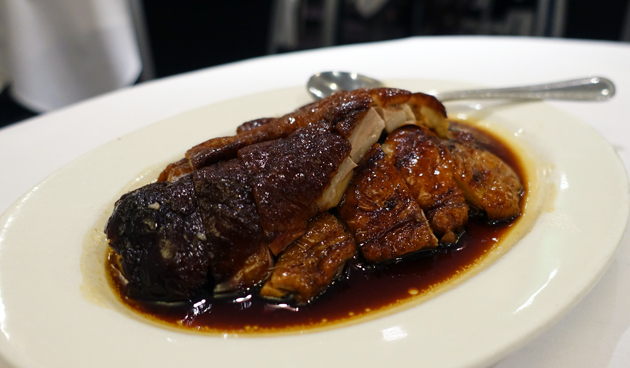 I chose the deboned option (the waitress will ask you what you prefer), which made it all the more easier to enjoy each piece of the duck with its crispy skin, layer of fat and tender meat soaked in a sweet soy sauce. It’s easy to cook duck badly and dry it out – this however, was perfect. A half-serving was the perfect amount as well – a quarter-serving would have left us craving more, but the half-serving was just the right amount to satiate our cravings. I had to order some vegetables and the Stir-Fried Mixed Vegetables was the easiest thing for me to read on the Chinese menu…ergo, that’s what I ended up ordering! 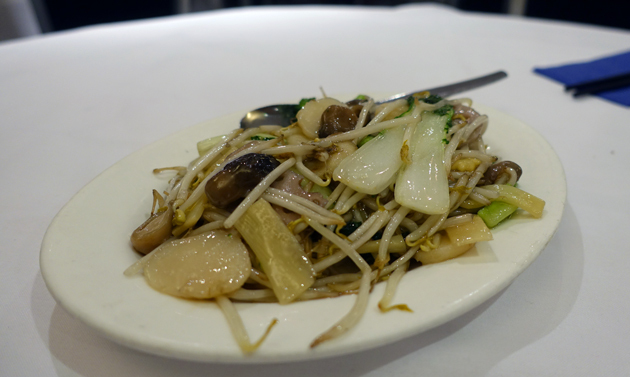 I was afraid that it was going to a boring mix of vegetables that wouldn’t normally be seen dead in a Cantonese restaurant, but it included a fantastic range of vegetables that we hadn’t tasted for a while. Bean shoots, baby bok choy, water chestnuts, mushrooms, baby corn…it was all here, and all deliciously healthy. 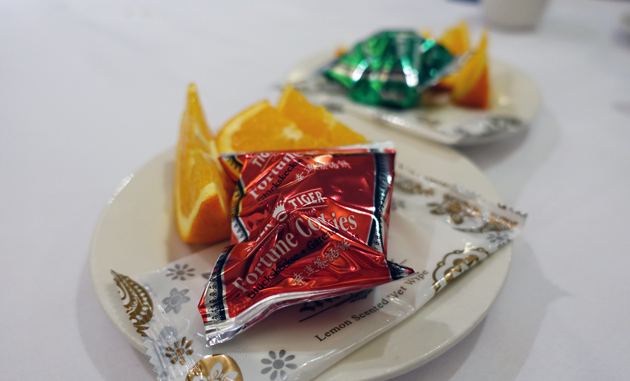 New Fortune Cookie is the type of Cantonese restaurant that finishes off every meal with a few slices of fresh orange to cleanse your palate, and a fortune cookie as a sweet treat. 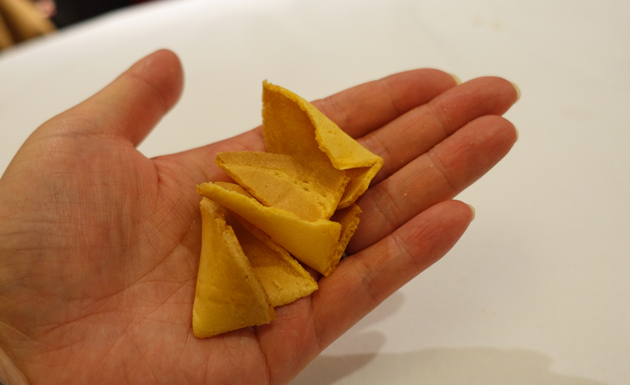 Interestingly, did you know that fortune cookies don’t actually exist in China? They’re an American invention, and many claim that it actually has its roots in Japanese temple traditions. Whatever the origins of the fortune cookie, it can still be fun to break open the cookie and read your fortune…so imagine my disappointment when my cookie had no fortune inside at all! I was tempted to ask the waitress for another, but refrained. New Fortune Cookie offers the type of old-school Cantonese dining experience that’s slowly being phased out by overpriced hipster fusion Asian eateries – do your best to support establishments like this while they’re still around! There’s nothing like dining in a large restaurant surrounded by people talking and laughing over each other as they eat delicious, hearty food on special occasions like Chinese New Year. I’m glad that we found this restaurant while we were in London – it was a little bit of home for us to enjoy on our travels. All up, our meal ended up costing us around 33 pounds, or around $66 AUD. 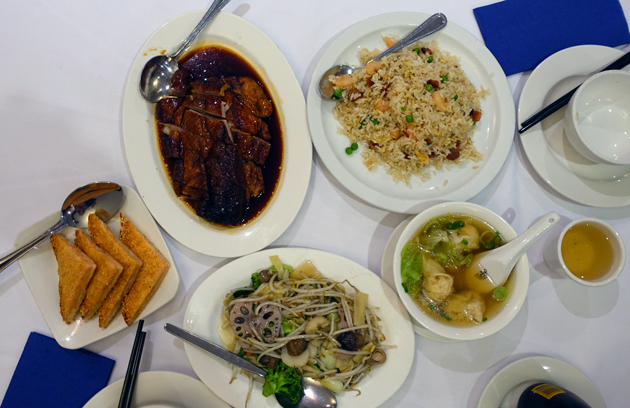 This is obviously far beyond what we would normally pay in Australia for a meal in a Cantonese restaurant like this (usually around $40), so Aussie Cantonese heading to London need to keep price differences in mind! Part of it has to do with the abysmal exchange rate, but there’s an element of location-charging here as well, as the restaurant is located in quite a nice part of London! New Fortune Cookie is located at 1 Queensway, London. As a side-note to price: with the current exchange rate it’s actually closer to 55 AUD, not 66. Yes, good point! Blog entry was written pre-Brexit.